Just what is the quintessential Maine house? A traditional Cape nestled into a hillside meadow? A classic lake ront cottage? A restored Victorian in a quaint village? Architect Chris Glass and photographer Brian Vanden Brink make a compelling and visually fascinating argument that the answer can in fact be all of the above. The critical element, notes Glass, is that the house fit its surroundings rather than compete with them. And in stunning photographs, Vanden Brink proves the point again and again throughout the book. 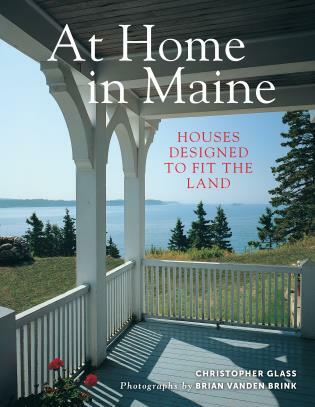 You'll discover a wide variety of Maine houses: some old, some new, and some combinations of the two, featuring innovative yet appropriate renovations. Glass explores the history of each house, its strengths and even its weaknesses; while Vanden Brink underscores the points as only a skilled architectural photographer can. Christopher Glass has been an architect in Maine for forty years. He is the former architecture member and chairman of the Maine Historic Preservation Commission and has worked with the organization Maine Preservation. He also taught Architectural Design at Bowdoin College. He resides in Camden, Maine. Acclaimed architectural photographer Brian Vanden Brink's work has appeared in dozens of books, including his award-winning monographs Ruin and Iconic. His photographs have also been published in numerous magazines, including Architectural Digest, Coastal Living, Custom Home, Fine Homebuilding, La Vie Claire, Old House Interiors, and Metropolitan Home. He lives in Camden, Maine.